I think I am having the busiest day imaginable so in posting this I am just taking a little bit of time out to breath. I launched the summer sale yesterday and the response has been great, plus I have a load of eBay auctions finishing today (baby clothes left over from the high street shop - some auctions are running til tonight if you want to have a look) and a pallet of Moulin Roty toys was delivered this morning containing lots of customer orders. Added to that we are going away for a few days on Sunday so I need to get all orders on their way by tomorrow lunchtime, when the post office closes. Right. Come on nose, back to that grindstone! If only Miss P could be that age again, I would have bought loads of things from your Ebay store. Just the kind of clothes I love for children of that age. Beautiful lavendar photo. Beautiful Humphrey too. I bet he loved those carrots! Oh, I love that long eared guy! Oh, my goodness there are so many lovely things at CB. I admired so many things when I browsed around last night. I love that little cream pitcher. Thinking about it . . . smile. Gosh, fancy being busy in this heat. 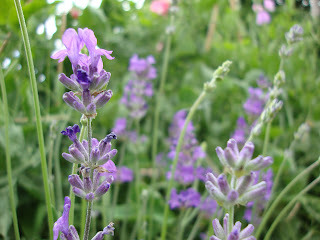 I hope you are coping well, keep inhaling the lavender, it's brilliant for calming you down. Have a lovely break when you finally getaway. I think you'll have earnt it by Sunday! Humphrey looks so happy with that carrot! 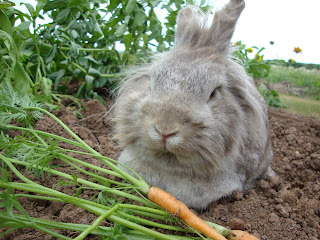 I had a nice house bunny a couple of years ago, she would have found your Humphrey to be a handsome bloke! Hi, I just wanted to let you know that this bunny just made my day. You know how I sort of hid my matchbox mouse from Birdie? Well, I showed it to her in moment of weakness and just as I suspected, she fell madly in love! So, Kelli (Birdie's mum and our daughter) ordered a bunch of Christmas gifts and a mouse for Birdie just yesterday. I know you are on holiday, but wanted you to know of our family love for Cottontails! he poses with such ease !